If you look straight ahead in-front of you from the port of the island of Aegina, it appears like a dark-green stroke of paint over the blue sea of the Saronic Gulf. The little island of Angistri is so full of pine trees that in antiquity it was called Pityousa, from pits, a pine-bearing tree today known as koukounaria (‘pine cones’). The ancients also called the island Kekryfaleia, a name mentioned by Homer, who tells us that during the Trojan War it was allied with Aegina. The archaeological finds from the island indicate that it was inhabited by at least 500 BC. If you would like to visit the beautiful island of Angistri, you may book your accommodation through our site and get a special discount. The island of Angistri lies around 3.5 nautical miles to the west of Aegina, and 22 nautical miles south-west of Piraeus. It has an area of 13 square kilometers, the largest part of which is covered in pine forests, olive groves, almond and fig trees. The ferryboats coming from Aegina and Piraeus moor at Skala, the natural harbor on the north-east coast of the island. This is also where most people come, and there are many hotels and taverns to serve the needs of visitors. The large, brilliant-white church of the Ayioi Anargiri, which dominates the port and is visible from quite a distance away, is impressive. The church celebrates its feast day on 1 July when there is a great fair. Above Skala, on the slopes of the mountain, is the village of Metochi, with a panoramic view over the beach and the sea. A coastal road leading from Skala in a south-westerly direction, passes first by the beach of Skliri and terminates at the pebbly beach of Halkida. Again from Skala, the central coastal road in the opposite direction (to the west) leads after 2 kilometers to Mylos, or, as it was later named, Megalochori (Big Village). This is the island’s largest village and also its capital. There is a harbor here at which the small boats which service local connections mainly moor (there is a marina), and there is also a pebbly beach for swimming. Megalochori and Skala share between them the island’s hotels, rented rooms and taverns. The metropolitan church of Megalochori is the Zoodochos Pigi, which celebrates its feast day on Easter Sunday. From the raised area above the harbor of Megalochori, which is on the north edge of the island, the road turns now towards the south, following the coast but this time from above and at a distance from the coast. Within the thick forests, the beautiful bays with the azure waters begin to make their appearance. One of these is the lovely beach of Dragonara, which can be reached via a little turning to the right. After a total of five kilometers from Mylos, the road terminates at Umenaria, the island’s fourth village. Here, there is a handful of tavems and the church of Ayia Kyriaki, which celebrates its feast day on 7 July, when there is a great fair. 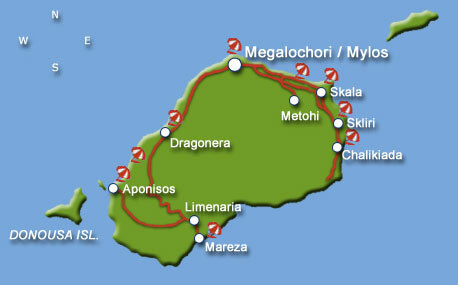 The route from Metochi to Skala, Mylos and Limenaria is serviced by a local bus. Turning once more, this time in a westerly direction, the road from Limenaria leads to a strange landscape with a singular beauty. Before reaching the coast, the road passes a small harbor and finally terminates at the sea, opposite the islet of Aponiso which lies next to Angistri. Further beyond is the larger islet of Dorousa which, along with the area’s other sights, creates a picture of exceptional splendor. Angistri, with its beautiful, primitive nature, good tourism facilities, the water sports and nightlife it has to offer the young, and, foremost, its beautiful, clean beaches, is a most attractive option which will continue to attract an ever-increasing number of visitors. Relaxation should be your main priority on the island of Angistri, however we have collected some organized activities for those who want to be lively. Skala: It is located on the northeastern coast , there is a natural port there where ferry boats arriving from Piraeus or Aegina. A sandy beach with crystal waters, hotels, studios, taverns, shops, you can find them all there. Ideal for families because of the shallow waters. Megalochori or Mylos: It is a lovely beach with pebbles and sand at the capital of the island. Ideal beach for swimming with emerald waters . In the area you can find restaurants and cafe shops, traditional houses and the unique wind mill. You will find it to the left of Slaka, it is a rocky beach with pine trees all around and an amazing view to the Saronic Gulf. Chalkiada is only accessible on foot and need caution but the natural bay with the big pebbles and the clear waters will reward you for your efforts. Through a beautiful journey with pine trees on one side and the deep blue on the other you will reach the sandy beach of Dragonera. There are the Small and the Big Dragonera. You can find deck chairs and umbrellas, sea sports and a canteen that offers coffees, refreshments, snacks etc. A graphical small port near Limenaria, with a rocky beach and green waters it is the perfect image of the pure beauty of the island. An exotic area full of pine trees all the way to the beach. The colors will remind you Pacific ocean or something like that, relax all day there and enjoy the sunset with sea food and ouzo. Angistri alone consists of the most important sight of the Saronic Gulf. 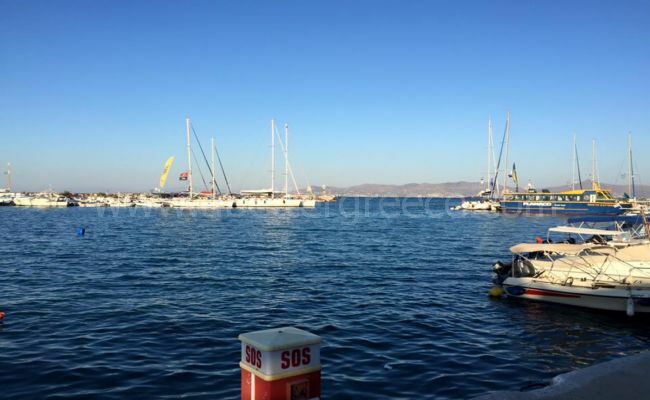 Just 45 minutes off Piraeus and 10 minutes from Aegina is the small paradise of the Saronic sea, with its hospitable people and its emerald waters. Ayioi Anargiroi: This is an imposing, white-washed Church with a light blue dome, situated in Slaka, and is celebrated on the first of July. Church of Zoodochos Pigi: This is the island’s Cathedral, it is in Megalochori and it is worth visiting its noteworthy murals. It is celebrated on Easter Friday and a fair also takes place. 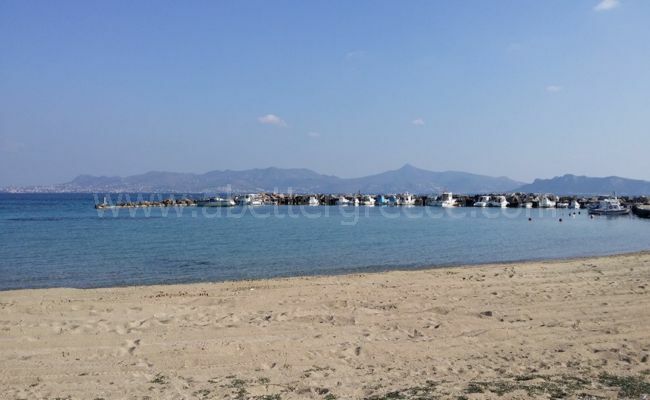 Ayios Nikolaos: Is situated outside Limenaria, a 10-minute walking distance. The Church of Agia Kiriaki: Situated in Limenaria and celebrated on the 7th of July. On that day a big fair takes place. The chapels of Ayioi Pandes and Ayioi Theodoroi: They are both situated in pine-dwelled woods above Megalochori and you can reach them through a 10-minute walk. They stand there through the passing of time and invite the visitor to learn about the island’s roots, Kadoudi, meaning the old village, what is left of Angistri’s oldest settlement. Virgin Mary at Metochi: This is achurch at Metochi and you can visit it by trekking. When you reach the Church you will be stunned by the amazing view. Ayia Varvara at Polemi: Situated in Polemi. The old Church of Ayia Varvara had the honor of being sanctified by St. Nektarios. Upon the island of Angistri, apart from the long, sandy beaches, there are locations and small villages that are worthwhile visiting. Megalochori (Mylos): Megalochori is the capital of Angistri and the biggest settlement of the island with 561 inhabitants. The town of Megalochori, also known as “Mylos”, is situated to the west of Skala and is the Administrative capital of the island. The community’s headquarters are situated in Megalochori. It has a natural port and a refueling marina for boats. Furthermore, this is the docking area for Flying Dolphins arriving from the port of Piraeus. Emerald crystal clear waters among natural bays which create sandy areas. Picturesque stone-paved alleys, traditional houses, cafeterias, elderly figures with local garments and the unique wind-mill, present through their existence this land’s vivid history. At Megalochori, you can admire the Church of Zoodochos Pigi, at the center of the village (1885). Stone made houses, white-washed benches, Indian-red roofs, home-made bakeries, tidy yards meet the modern hotel units. Leaving the village and towards the pine-dwelled woods the visitor meets the small church of Saint Apostolon, an old church which invites the visitor to learn about the island’s roots, Kadoudi, meaning the old village, what is left of Angistri’s oldest settlement. Skala: Skala is on the island’s northeastern coast and has a natural port where ferry-boats arriving from Piraeus or Aegina dock. Skala is a settlement which has a very good tourism infrastructure with sparkling clean hotels, rooms to let and studios. It has 354 inhabitants and is 1 kilometer from Megalochori. At Skala, with its imposing, white-washed Church of Ayioi Anargiri, there is a large sandy beach, with golden sand and crystal clea, shallow waters. Most people gather at its beach with various amenities and facilities, just 100m. off the port and especially families since the sea is shallow and it is ideal for children. At the restaurants and fish-taverns you may taste and enjoy a great variety of appetizers and snacks, oven-cooked food, grilled meat, fresh fish and sea-food from the island’s fishermen, accompanied with chilled wine. For your entertainment there are cafes-snack bars and clubs operating at all times, from morning until… the next morning. Metochi: Between Skala and Megalochori, to the slope of the mountain, is located Metochi. In Metochi you go either through Skala, either through Megalochori from the coastal road. Metochi is a beautiful, fresh and picturesque village with panoramic view. Its worth visiting the small Church of Virgin Mary. The view from there is fantastic. Also in Metochi there is a family tavern of Parnassos, full of pine trees. Limni: Limni is a very beautiful location, full of pine trees, which is to the road that leads to Limanaria and Aponissos, and is worth visiting. Limni is close to Aponisos and is being called Lekani. Close to Limni, is located the small Church of Saint Nikolas. Limenaria: After Polemi, the road leads to Limenaria, a traditional village, the third biggest settlement of Angistri, at the southern of the island, 4.5 kilometers from Megalochori and with 105 inhabitants. Limenaria are distinguished for their local tradition and their unique cultural elements. Some of the allure and the beauty the place has to show is the big pine trees, olive trees, stone made houses, the old school, the big Church of Saint Kiriaki and the picturesque small port of Mareza. At the tavern of the village you can taste traditional Greek cuizine. From Limenaria, another road leads to the rocky beach of Mareza, with the deep clean and crystal sea, where visitors prefer to moor their boats. Angistri along with Aegina and the neighboring islands consisted of the Kingdom of Aegina of the mythical King Aeakos. According to Homer, Angistri was called Kekrifalia, which means “adorned head” and appears as an ally of Aegina during the Trojan War. Other historians who mention the island are Thucydides and Diodorus. Kadoudi, Megaritsa and Kodari are of archaeological interest. Throughout the whole of the island’s west coast there are antiquities situated just below the sea surface. There are various archaeological findings in Megalochori at the Cultural Center. These findings indicate that the island was first inhibited at least starting from the 5th century B.C. by Peloponnesians who came to the island. In general, concerning the island’s history not much has been recorded by historians. At times, in its more recent history, roughly in the 14th century, Angistri received many settlers from the coasts of Peloponnese, situated right across it. Later on, Angistri became a part of the Ottoman Empire. In 1821 the island was yet again inhabited by a small number of people. In 1835 the Community of Angistri was formed by Royal Decree. According to the inventory that took place at the time, there were 248 inhabitants. Until 1940 the island’s inhabitants remained few. Until 1960 the island became directly connected to Piraeus and in 1973 electricity was supplied to the island. Angistri lies around 3.5 nautical miles to the west of Aegina, and 22 nautical miles south-west of Piraeus. It has an area of 13 square kilometers, the largest part of which is covered in pine forests, olive groves, almond and fig trees. The ferryboats coming from Aegina and Piraeus moor at Skala, the natural harbor on the north-east coast of the island. This is also where most people come, and there are many hotels and taverns to serve the needs of visitors. The large, brilliant-white church of the Ayioi Anargyri, which dominates the port and is visible from quite a distance away, is impressive. The church celebrates its feast day on 1 July when there is a great fair. Again from Skala, the central coastal road in the opposite direction (to the west) leads after 2 kilometers to Mylos, or, as it was later named, Megalochori (Big Village). This is the island’s largest village and also its capital. There is a harbour here at which the small boats which service local connections mainly moor (there is a marina), and there is also a pebbly beach for swimming. Megalochori and Skala share between them the island’s hotels, rented rooms and taverns. The metropolitan church of Megalochori is the Zoodochos Pigi, which celebrates its feast day on Easter Sunday. From the raised area above the harbor of Megalochori, which is on the north edge of the island, the road turns now towards the south, following the coast but this time from above and at a distance from the coast. Within the thick forests, the beautiful bays with the azure waters begin to make their appearance. One of these is the lovely beach of Dragonara, which can be reached via a little turning to the right. After a total of five kilometers from Mylos, the road terminates at Umenaria, the island’s fourth village. Here, there is a handful of taverns and the church of Ayia Kyriaki, which celebrates its feast day on 7 July, when there is a great fair. The route from Metochi to Skala, Mylos and Limenaria is serviced by a local bus. Turning once more, this time in a westerly direction, the road from Limenaria leads to a strange landscape with a singular beauty. Before reaching the coast, the road passes a small harbor and finally terminates at the sea, opposite the islet of Aponiso which lies next to Angistri. Further beyond is the larger islet of Dorousa which, along with the area’s other sights, creates a picture of exceptional splendor.